ONE OF THE MOST BEAUTIFUL WATERFRONT PROPERTIES ON THE RIVO ALTO CANAL. Its architecture, finest of craftsmanship, meticulously selected materials & amenities throughout are enduring. An understated but elegant vibe for everyday coastal living, makes this home a true masterpiece by the most discerning standards. Private dock, coveted 4 car garage, elevator & abundance of outdoor living space are just a few striking features. Main level interior consists of open concept kitchen/living/dining w/mesmerizing aquarium, powder rm., & waterfront patio w/firepit offering wide open views of adjacent park. 2nd level is adorned with 3 exquisitely appointed en suite bedrooms, & panoramic views from master suite. This homeâs 3rd level is the showstopper. Voluminous flex room w/fireplace & bath is flanked w/ 2 amazing outdoor living spaces. Main spacious deck comprises a seldom seen full outdoor kitchen, hand carved bar, firepit, dining/lounge area, commanding amazing panoramic views. 2nd upper deck has a cozy fireplace & spacious retreat area to enjoy open possibilities w/sunsets. There's an interplay between interior & exterior spaces, accentuated by sweeping picturesque day/night time views expanding as you ascend to upper levels. Walk/bicycle the neighborhood; beach 2 blocks away, parks, fine restaurants, upscale boutiques & art galleries. 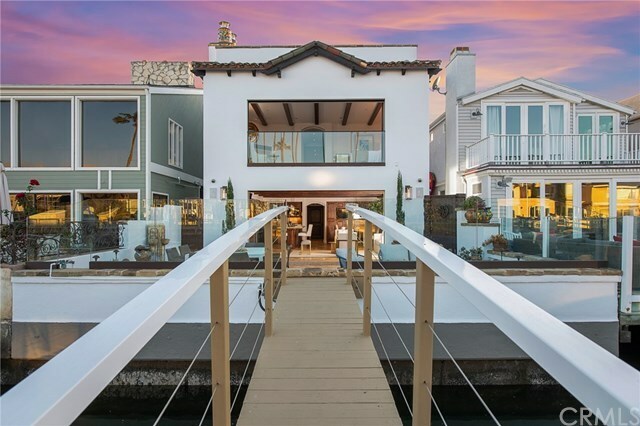 Magnificence throughout this turnkey property makes it one of the most impressive luxury waterfront opportunities on the entire Balboa Peninsula! Directions: From Coast Hwy., turn onto Balboa Blvd., turn left on 38th St., then left on River Ave.